West Dunbartonshire’s MP has spoken in parliament against the Prime Minister’s proposed EU Withdrawal Agreement and pledged to support a second referendum on Brexit. 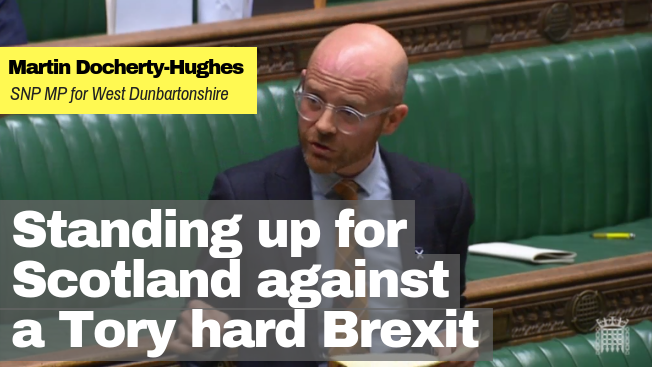 SNP MP Martin Docherty-Hughes said that the UK is in a constitutional crisis as a result of Brexit, highlighting that Scotland and West Dunbartonshire faced being dragged out of the EU against its democratic wishes. The local MP was speaking at the start of five day debate on the draft Brexit deal brought forward by the UK government, which will be subject to a vote by MPs. “These are historic times in the House of Commons, and future generations will judge us on the decisions we make in the coming days. “I will not support a Brexit deal that puts jobs at risk and threatens the living standards of my constituents. West Dunbartonshire and the rest of Scotland voted clearly to Remain, yet we face being dragged out of the EU against our will by a Tory UK government that we didn’t vote for. “We were promised strong and stable, but what we are getting is a government in crisis that has been found to be in contempt of parliament after being defeated on three consecutive votes – the first Government to do so in 40 years. “From speaking with constituents at my surgeries and on the doorsteps the overwhelming message is that people feel let down by a UK government that is treating Scotland with utter contempt.